The vast research on organisational justice has focused on the organisation and the supervisor. This study aims to further this line of research by integrating two trends within organisational justice research: the overall approach to justice perceptions and the multifoci perspective of justice judgments. Specifically, this study aims to explore the effects of two additional sources of justice, coworker-focused justice and customer-focused justice, on relevant employees’ outcomes—burnout, turnover intentions, job satisfaction, and workplace deviance— while controlling the effect of organisation-focused justice and supervisor-focused justice. Given the increased importance attributed to coworkers and customers, we expect coworker-focused justice and customer-focused justice to explain incremental variance in the measured outcomes, above and beyond the effects of organisation-focused justice and supervisor-focused justice. Participants will be university students from Austria and Germany employed by service organisations. Data analysis will be conducted using structural equation modeling. Keywords: organisational justice , multifoci justice , burnout , turnover intentions , job satisfaction , workplace deviance. Organisational justice has shown to be a major predictor of employees’ performance (Colquit et al., 2013), well-being (Robbins, Ford, & Tetrick, 2012), and counterproductive behaviours (Devonish & Greenidge, 2010). Research on this field has focused on the justice events employees experience at work, that is, the allocation of rewards, the procedures used to allocate those rewards, and the quality of interpersonal interactions (e.g., Cohen-Charash & Spector, 2001). As an alternative to this focus on “types” of justice, scholars have recently begun to consider an overall approach to justice perceptions which has been referred to as overall justice (e.g., Ambrose & Arnaud, 2005). Rather than focusing on the specificity of each type of justice—which may not accurately capture employees’ justice experiences— the overall approach focuses on the total impact of justice and, thus, overcomes the fragmented view of justice experiences within the workplace (Ambrose & Schminke, 2009). The overall approach to justice offers a key opportunity to examine justice through a multifoci perspective. Instead of focusing on the types of justice, the multifoci perspective focuses on the perpetrator or party responsible of the (in)just act—a cornerstone within fairness theory (Folger & Cropanzano, 2001). This perspective posits that there are multiple sources or foci of justice—persons, groups, and even entities—from which employees can make meaningful justice judgments, as they can hold them accountable for violating or upholding justice norms (Rupp & Cropanzano, 2002). Evidence based on this line of inquiry has shown that employees are able to differentiate the (in)just treatment they receive from their organisation as a whole, their supervisors (Rupp & Cropanzano, 2002), their coworkers (Branscombe, Spears, Ellemers, & Doosje, 2002), and their customers (Rupp, McCance, Spencer, & Sonntag, 2008). The vast research on workplace justice, however, has focused on the (in)just treatment provided by the organisation and the supervisor (Colquitt et al., 2013; Rupp, Shao, Jones, & Liao, 2014). To our knowledge, to date no study has examined the effects of coworkers and customers as sources of justice, beyond the effects of organisation-focused and supervisor-focused justice and through the lens of the overall justice framework. The studies that have included at least two sources of justice have generally done it through the fragmented lens of types of justice, instead of examining the total impact of justice facilitated by the overall approach (e.g., Skarlicki, van Jaarsveld, & Walker, 2008). 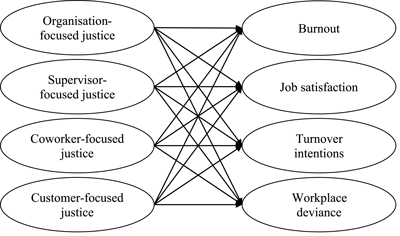 Thus, through a four-factor model of justice, this exploratory study aims at examining the incremental effect of coworker-focused justice and customer-focused justice above and beyond the effects of the more traditional sources of justice, organisation-focused justice and supervisor-focused justice, on four employees’ outcomes: burnout, turnover intentions, job satisfaction, and workplace deviance. Hypothesis: Coworker-focused justice and customer-focused justice will explain incremental variance in employees’ burnout, turnover intentions, job satisfaction, and workplace deviance, above and beyond the effects of organisation-focused justice and supervisor-focused justice. The study will be conducted using a cross-sectional, online survey-based design with self-report measures. The hyperlink of this survey will be distributed via the social science newsletters of each participating university. The first set of questions will assess the English level of the participants. The next set of questions will assess the measures comprising the proposed model and the final set of questions will enquire demographic information. The sample will consist of students from three different universities from Austria and Germany that are currently employed (part-time or full-time) by service organisations, such as hotels or restaurants. These types of organisations generally require their employees to interact with customers—an important source of justice included in this study (Schneider & White, 2004). Participation will be confidential and voluntary. Based on previous recommendations, the goal of this study is to collect data from at least 200 participants (Weston & Gore, 2006). Considering that Austria and Germany are among the countries with highest levels of English proficiency (EF English Proficiency Index; Education First, 2013), all measures will be assessed in the language in which they were validated—i.e., English. All measures with the exception of English proficiency will be reported on a 7-point Likert scale, ranging from 1, strongly disagree, to 7, strongly agree. Overall justice perceptions. Each measure of overall justice perceptions—coworker-focused justice, customer-focused justice, supervisor-focused justice, and organisation-focused justice—will be assessed using the three items from the Perceived Overall Justice scale (POJ) developed and validated by Ambrose and Schminke (2009) that refer to individuals’ personal justice experiences. These items will be adapted to adequately capture the four sources of justice that will be assessed. An example item is “Overall, I’m treated fairly by my [coworkers]”. Burnout. Burnout will be assessed with the Maslach Burnout Inventory—General Survey (MBI–GS) validated by Schaufeli, Leiter, Maslach, and Jackson (1996) which includes three subscales. Five items refer to exhaustion (e.g., “I feel used up at the end of the workday”), five items to cynicism (e.g., “I have become less enthusiastic about my work”), and six to professional efficacy (e.g., “In my opinion, I am good at my job”). Job satisfaction. Job satisfaction will be measured by five items from the Job Satisfaction Index (Brayfield & Rothe, 1951) validated by Ambrose and Schminke (2009). An example item is “I find real enjoyment in my job”. Turnover intentions. Turnover intentions will be assessed using the four-item scale developed and validated by Kelloway, Gottlieb, and Barham (1999). An example item is “I am thinking about leaving this organisation”. Workplace deviance. Workplace deviance will be measured using the 12-item Organisational Deviance scale developed and validated by Bennett and Robinson (2000). An example item is “Come in late to work without permission”. Control variables. In addition to controlling for gender, age, type of contract (part-time vs. full-time) and average working hours per week, English proficiency will be assessed. To that end we will use the three-item scale validated by Guerrero and Rothstein (2012) that measures ability to speak, read, and write in English, using a 10-point scale ranging from 1, extremely poor, to 10, excellent. Additionally, participants will have to position their English reading ability based on the six anchors, ranging from A1 to C2, described by the reading dimension of the Common European Framework of Reference for Languages (Verhelst et al., 2009). Before examining the proposed multifoci model, this study will test whether the different sources of perceived organisational justice are indeed measuring different constructs. To this end, two measurement models will be compared: a) the proposed four-factor model which will specify that observed variables load only onto their corresponding latent variables—coworker-focused justice, customer-focused justice, supervisor-focused justice, and organisation-focused justice— and b) an alternative one-factor model which will specify that observed variables load onto the same latent variable which does not differentiate the sources of justice—justice as whole. To assess the fit of these models we will examine the following fit indices: root mean square error approximation (RMSEA), comparative fit index (CFI), and standardised root mean square residual (SRMR) (see Weston & Gore, 2006). These indices will be also used to test model differences (Chen, 2007; Cheung & Rensvold, 2002). Because the identification of the party responsible of the (in)just act—i.e., source of justice—is a key aspect within fairness theory (Folger & Cropanzano, 2001), it is expected that the four-factor model will show a better fit to the data than the alternative one-factor model. After confirming the measurement model, the path from each source of justice to each outcome variable (see Figure 1) will be examined using structural equation modeling (SEM). Once again, RMSEA, CFI, and SRMR will be employed to assess the fit to the data. All data analyses will be conducted using IBM SPSS AMOS 21 (Arbuckle, 2012). As previously mentioned, all participants will be currently enrolled at German or Austrian universities. Since this study does not involve an experimental manipulation or the participation of minors, these universities do not have a requirement to present the study in front of an ethical committee. These universities, however, do require participants to give informed consent. Hence, before starting with the survey, all participants will be provided with information about the study—including issues such as purpose of the study, procedure, confidentiality, and contact information—and ask to give informed consent. This informed consent will be written in accordance to the guidelines of the BDP Germany (League of German Psychologists) and the BÖP Austria (Union of Austrian Psychologists). The research team had access to up to four different countries. Thus, an important concern addressed in this study was the selection of the countries in which the sample will be collected. Conducting the survey in all four countries would raise several issues. For instance, all measures should be translated to three different languages, it would be necessary to test for model invariance—which would require a larger sample size— and it would also be necessary to account for cross-cultural differences—which would require extending the survey— among other issues. Hence, the research team contacted the Organisational Behaviour Division of the Academy of Management to ask for guidance. The responses received by several experts in organisational behaviour suggested collecting the data from Austria and Germany using the original English measures in which the measures had been validated. This decision relies on the results shown by the EF English Proficiency Index (Education First, 2013) that indicate that Austria and Germany are among the countries with highest levels of English proficiency. Even though this strategy requires to control for English proficiency, it does not affect sample size nor requires extending the survey. Thus far, the research team has made a structured review of the literature and selected the instruments that will be included in the study to adequately assess the effects of the different sources of justice on the outcome variables. Also, representatives from each participating university have been approached to discuss the ethical procedures that should be considered for the study. Currently, the online survey is being designed using the software SoSci Survey. Data collection is set to commence in January 2015 and is expected to last two months. Previous findings have highlighted the relevance of the (in)just treatment provided by authority figures, such as the organisation and the supervisor. The increased use of team settings (Mathieu et al., 2008) and the importance attributed to the employee-customer encounter (Schneider & White, 2004), suggest these sources of justice will not entirely capture the impact of justice perceptions. Despite presenting some limitations, such as using self-report measures or implementing a cross-sectional design, we believe this study will provide evidence showing that coworker-focused justice and customer-focused justice are also key in determining employees’ burnout, turnover intentions, job satisfaction, and workplace deviance. That is, this research will allow scholars and practitioners to better understand the importance of the sources of justice responsiblea for the (in)just treatment employees receive at their workplace. Following this same line of research, future studies should consider the target similarity model (Lavelle, Rupp & Brockner, 2007) as a framework to further examine the differential effects promoted by the distinct sources of justice. Ambrose, M. L. and Arnaud, A. (2005). Distributive and procedural justice: Construct distinctiveness, construct interdependence, and overall justice In: Greenberg, J. and Colquitt, J. eds. The handbook of organisational justice. Mahwah, NJ: Erlbaum, pp. 59–84. Arbuckle, J. L. (2012). Amos 21 user’s guide. IBM Corporation. Education First (2013). EF EPI English proficiency index In: Madrid: Author. Folger, R. and Cropanzano, R. (2001). Fairness theory: Justice as accountability. Stanford: University Press. Schaufeli, W. B., Leiter, M. P., Maslach, C. and Jackson, S. E. (1996). The Maslach Burnout Inventory: General Survey In: Maslach, C., Jackson, S. E. and Leiter, M. P. eds. Maslach Burnout Inventory manual. 3a Ed. Palo Alto, California: Consulting Psychologists Press. Schneider, B. and White, S. S. (2004). Service quality: Research perspectives. Thousand Oaks, CA: Sage. Verhelst, N., Van Avermaet, P., Takala, S., Figueras, N. and North, B. (2009). Common European Framework of Reference for Languages: learning, teaching, assessment. Cambridge University Press.